The PRG designed and developed the Direct Environmental Acquisition Data logging system (D.E.A.D. )TM in order to data log and analyze large amounts of environmental data during investigations. Data logging with date-time stamping allows us to look for correlations between the different environmental changes, subjective paranormal experiences, and anomalies on video and in photographs. Being able to correlate at least two pieces of data (ie: EMF and a personal experience, radiation drops and an anomaly on a photo, radiation spike and a recorded EVP, etc) provides more credible evidence AND allows us to discover what the correlations might be between paranormal phenomena and environmental changes. Ultimately, this type of quality information may help us determine how a haunting affects the environment, what is normal and what is paranormal, if environmental changes cause people to have subjective paranormal experiences, and what type of information is needed to determine what a haunting is and is not. This is the type of information that is needed in order to advance the field of paranormal investigation. How is the DEAD system unique? 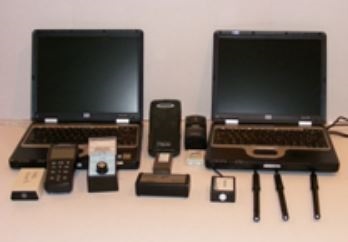 While the idea of a data logging system is not new (others include: MESA, GEIST, ARCADIA, and MADS), this system is especially unique in the type and quality of the data collected, especially for EMFs. The Triaxial ELF magnetic field meter records data independently on the X, Y, and Z-axes every 0.5 sec. A SUM measurement is also recorded. The resulting data can then be analyzed and graphed using any number of software programs. The fluxgate magnetometer model 539 is an extremely sensitive high-speed sensor that offers many unique features that are useful for paranormal work: it samples AC and DC fields at a high rate on a multi-axis basis (X, Y, Z and SUM); it has a fast sample rate of at least 250 samples per second; it measures field strength; it can measure changes down to 0.005mG; and it measures the field strength at any given frequency. Not only can we determine changes in the field BUT we can also determine the frequency! Why is the DEAD system essential to what we do? Meters that report only the SUM may not provide the entire story of what is happening with the spatial and temporal changes in the EMFs. For example, if there was a 4mG drop in the X-axis with a corresponding 4mG increase in the Y-axis, the SUM may only show a small change if it would show one at all. Therefore, recording data independently for the X, Y, and Z-axes in addition to the SUM will provide greater insight as to what is happening with the EMFs. Data logging is essential if we are to determine if subjective paranormal experiences coincide with environmental changes. Other investigators have reported changes such as temperature drops, EMF spikes, motion detectors going off, etc during a paranormal experience. On the other hand, people have reported experiences with no equipment readings. So, what is really happening? Perhaps the equipment used was not sensitive enough. Maybe there was a change in one axis while there was an opposite change in another axis and it was not detected in the SUM reading. The investigator using handheld equipment may have simply missed the reading due to the excitement felt during the experience. It is also possible that the entire experience was in the head of the investigator and there was no environmental change at all. Using a highly accurate data logging system helps alleviate some of these possible problems and assist in elucidating what is really happening. * Triaxial ELF magnetic field meter with pc interface. The meter has a bandwidth of 30Hz to 2000Hz and an accuracy of +/- 3% at 50Hz/60Hz and +/-5% at 40 to 200Hz. Data is logged using the supplied software. * HOBO Temperature data logger from Onset Computer Corporation with data logging and archiving ability. Software provided by Onset Computer Corporation is used for data logging and archiving. * GM-10 radiation detector from Black Cat Systems with pc interface. The Radiation Acquisition and Display (RAD) Software was used to log and archive the data. Radiation detected includes alpha, beta, and gamma/x-ray. Data is displayed as counts per minute (cpm). * Tri-field natural EMF meter modified to be data logged by the HOBO data logger. * GO! MOTION Ultrasonic Motion Detector . * Fluxgate Magnetometer Model 539 with APS software. The fluxgate magnetometer model 539 is an extremely sensitive high-speed sensor that offers many unique features that are useful for paranormal work: it samples AC and DC fields at a high rate on a multi-axis basis (X, Y, Z and SUM); it has a fast sample rate of at least 250 samples per second; it measures field strength; it can measure changes down to 0.005mG; and it measures the field strength at any given frequency. Not only can we determine changes in the field BUT we can also determine the frequency! * Vernier Magnetic Field Sensor. * Vernier Barometric Pressure Sensor. * Vernier LabPro Sesnor/PC Interface. * Quantis USB Random Number Generator. The following is an example of some of the data the D.E.A.D. system can collect and its’ usefulness (this is from a case at a private home in Milwaukee). At approximately 7:50pm, Cindy Heinen reported feeling a cold ‘draft/breeze’ around her neck/should/arm area. Tara Davig-Razo took a time series of photos when Cindy reported her experience. The photo at 7:50pm shows a dark mass/shadow/blob over Cindy’s head. The radiation also drops to 0 cpm. There was a drop in Y-axis EMF and an increase in the Z-axis EMF. Another photo taken a few seconds later shows nothing. Another photo taken at 7:53pm also shows nothing. There was no decrease in temperature recorded during this time period. FFT analysis of the fluxgate magnetometer data shows a 60Hz signal. Here is an example of EMF data that was collected when people were having auditory experiences at a private home in Sun Prairie, WI. Two investigators asked, “Can you show yourself to us?” A voice saying, “Yes” was heard by the investigators who were the only people in the room at that time. A whimpering sound was heard by three of the six people in the room. There was a large ‘spike’ in the EMF of 267mG when the owner attempted to antagonize whatever was there. The graph below shows the EMF data collected during the times that the above events occurred. The numbers above the ‘spikes’ on the graph correlate with the numbered events above.